Dr. DD's Blog: Ashwatthama Sighted – The Chiranjeevi who wants to die!! Ashwatthama Sighted – The Chiranjeevi who wants to die!! We saw in the last blog that Ashwatthama was a Chiranjeevi, an immortal being who lives and treads among us in modern times. I also hinted that what was a boon for the other Chiranjeevis was a curse for Ashwatthama. This post explains it further. Once Duryodhana was defeated in the Mahabharath war, Ashwatthama wanted to take revenge against the Pandavas for killing his father through unfair means and also for destroying the Kaurava forces, to which he owed his loyalty. 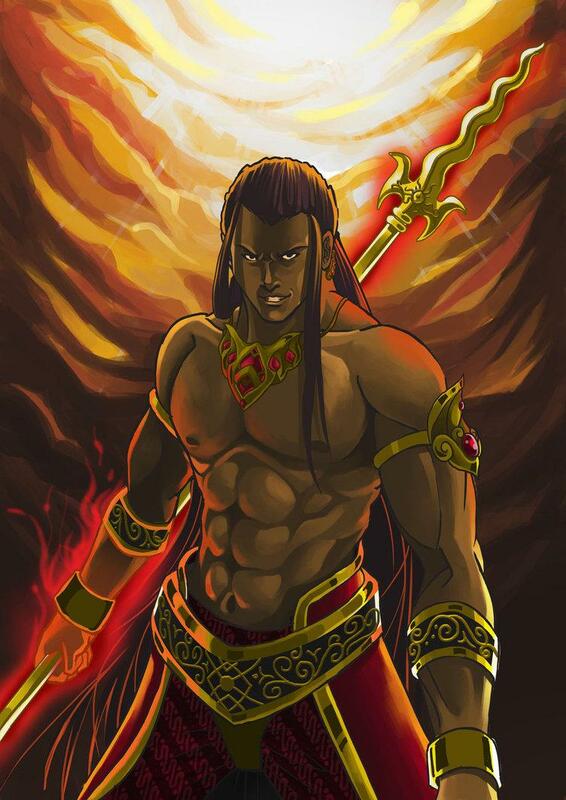 A livid Ashwatthama, vowed to destroy the lineage of Pandavas. Contemplating his next move, he saw an owl silently attacking a flock of crows in the night. Inspired, by this, he wanted to swoop silently on the Pandava camp in the dead of the night and kill the Pandavas. He executed his plan successfully, but there was a fatal flaw. The Pandavas were actually in the Kaurava camp on that night and were just coming back. Instead, all the living sons of the Pandava brothers were killed. Ashwathama was on his way out after killing, but was surprised by the sight of the returning Pandavas. The Pandavas also realized the extent of Ashwatthama’s foul play against their sons. 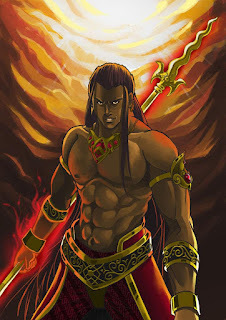 Ashwatthama in desperation resorted to the maximum force available with him ‘The Bramhastra’, a fearsome divine weapon. To invoke the astra, he used a blade of grass and used the ancient knowledge of arcane shlokas said in a specific manner in a specific tone. This was almost like a password or voice command. To counter the astra Arjun also projected his own Bramhastra, the only way to counter the oncoming astra. With the fearsome power of two astras detonating simultaneously the destruction of the earth was eminent. In this desperate time, Sage Vyasa with his yogic powers stopped the collision and asked both warriors to take back the astras. The astras were controlled by the voice commands that were used to target or call back. Arjun invoked the voice command to take back the astra while Ashwatthama conceded that he did not know how to do it. A warrior who can invoke and take back an astra can use it multiple times but those who cannot revoke the astra can only use it once. Guru Drona felt that Arjun was his only student who is blessed with both character and competence. Hence, only Arjun was given full knowledge of the Bramhastra - both the art of sending the missile and withdrawing it in times of need. Ashwatthama meanwhile was given the option to direct it towards the destruction of just one object and out of his spite filled rage he directed it towards the womb of Uttara, wife of Abhimanyu and tried to kill the yet unborn son. Krishna was enraged by this spiteful behavior. Krishna cursed Ashwatthama to be a Chiranjeevi and roam the earth for eons to come. Ashwatthama was cursed to carry the burden of all people’s sins on his shoulders and to roam alone like a ghost without getting any love and courtesy till the end of Kaliyuga; he would have neither any hospitality nor any accommodation; he would be in total isolation from mankind and society; his body will suffer from a host of incurable diseases forming sores and ulcers that would never heal”. He took back his crowning glory, the jewel on his forehead and left his forehead with a gaping wound that was pus filled, festering and with a foul smell. He was also cursed to forget all of his knowledge and his entire memory erased. He would be known as Suryakant in Kaliyuga. For a legendary warrior who was a storehouse of knowledge this was the worst form of punishment. An endless life of wandering the earth without knowledge, in pain and with a festering wound. He was given the task of accompanying other chiranjeevis for greeting the next Vishnu avatar Kalki at the time of his birth. With a bleeding forehead, Ashwatthama roams around the earth and the stories of his encounters with those living abound. An exceptionally gifted doctor in Madhya Pradesh claimed that he treated a tall dark man with a festering wound for five years without success. He invoked the similarity between his wound and Ashwatthama, upon which the person disappeared. Near Burhanpur, within the confines of an old rundown fort of Asirgarh a small Shiva temple has a devotee who has been offering flowers since times immemorial perhaps to ask for forgiveness and stop the pain. Some yogis said that they have had conversations with Ashwatthama who lives among a Bheel tribe in the foothills of the Himalayas. Prithviraj Chauhan is supposed to have met Ashwatthama and tried to cure his wounds but failed to do so. A book written on him called “Pritviraj Rasso” describes this meeting. In late 14th, early 15th century there lived in Gadag, Karnaatak, a poor Braahman called Naranappa achieved fame with his rendition of the Mahabharatha in kannada. The story goes that he was told the Mahabharatha as it happened by Ashwatthama himself. In case you are visiting the foothills of Himalays or to any of the above mentioned places, perhaps you will be blessed with the sight of an old man with a festering wound and a foul smell with an aura of intrigue about him. Perhaps you too will be blessed with the darshan of a Chiranjeevi, one who is suffering and is in search of death. Do not worry, he will not harm you nor does he have the capacity to harness his legendary powers or any of the Bramhastra. His memory has been wiped out and his knowledge lost! Be brave enough to meet him, in case you sight him! Good Luck!